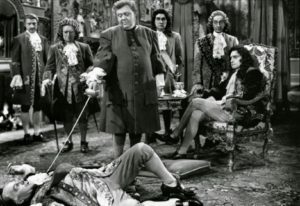 Speaking of the gaunt and ever-sinister John Carradine, he may be the best of the fine character actors supporting Laughton in this film, but he’s not the only one: there’s Gilbert Roland as another of Kidd’s lieutenants, the suave but avaricious Spaniard Lorenzo, the haughty Henry Daniell as King William III, and Reginald Owen as the snooty Shadwell, the butler employed by Kidd to teach him how to act like “a person of quality.” The one wrong note comes from the casting of Randolph Scott as Adam Mercy, the ex-pirate who joins Kidd’s crew as master gunner, but whose manners and attitude betray an aristocratic background. The problem is that Scott, a tall square-jawed American best known as a two-fisted cowboy in Western movies, is about as aristocratic as beer, and about as piratical as an Eagle Scout. As the king’s infiltrator in Kidd’s crew, it’s just unbelievable that Kidd and his cutthroats would be taken in by him for a moment. But this is Hollywood, so in the end cowboy virtue wins out over ruthless duplicity. At least Laughton gets in a mocking final speech. Fun fact: according to Nikita Khrushchev’s memoirs, this was one of Josef Stalin’s favorite films. He’s said to have been delighted by Laughton’s portrayal of the unrepentant and utterly unprincipled pirate captain. Is good!